Many people have contacted me through my blog and asked me how to fix a tear / rip on the Aulora Pants with Kodenshi. The repair process is actually quite simple and all you need is a bottle of clear nail polish. Note: This solution is for small holes or tear in the pants. If you have a big rip on your pants, this solution may not work. 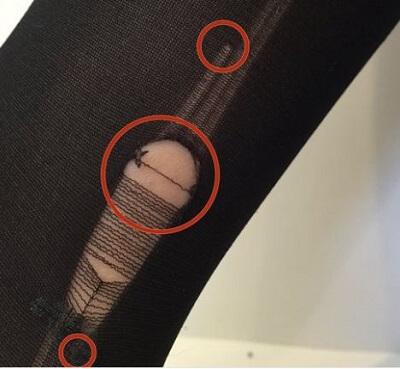 In the following segment, I will share the 4 simple steps to repair the tear on the legging. First, you need to locate the tear area. Put the pants on your hand like a glove or shirt sleeves and spread the material to locate the hole. When you have located the hole, you need to look closely to identify the potential run areas. This solution will not seal the hole, rather you want to prevent potential run or prevent the rip from getting bigger. The runs on the hole usually will expand horizontally. It will also expand vertically too. This is due to the knitting process of the pants. The Aulora Pants is made using a medical grade circular knitting machine. Spread the pants material with your finger to expose the hole and all the potential run areas. Next, brush a dollop of clear nail polish on all the potential runs. If it is a big hole, apply a thin coat of nail polish on the edge of the hole. Repeat this process to all potential runs and on any loose thread. Note: Do not cut any loose thread to prevent further potential runs. Finally, leave the nail polish to dry. There you have it, 4 simple steps to repair a tear on the Aulora Pants. From my experience, people tend to tear their Aulora Pants at the stitching joints because they pulled on the material too hard. Remember, the pants has been designed to be thin for a reason. It is designed to be comfortable when worn for long duration. Therefore, don’t treat the pants like a pair of jeans. Be extra gentle and careful when you are putting it on. Some of the most serious tears on the pants I’ve seen were caused by plastic clothes hanger. My suggestion is, DO NOT use a clothes hanger to dry the pants. If possible, just leave it on a chair and dry the pants under a fan. I’ve seen a few cases where the pants were dried on a plastic clothes hanger. 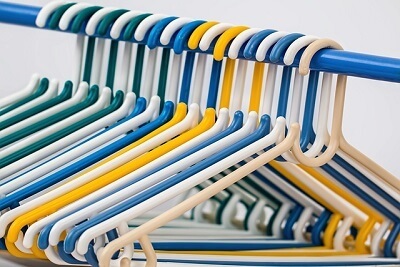 Because there are small sharp edges on the hanger, by simply pulling on the pants, the pants material will snag on the sharp edges and cause multiple tears. That will really ruin your pants. I hope my sharing above has been helpful. Did you register as a member when you bought your Aulora Pants? The link below shows the 4 benefits of a member. Do you know there is a potential to build a business for side income with the Aulora Pants? If you want to know more, just click the link below to contact me through WhatsApp and I will share more with you.